In December, I tried to build a writing habit. Following an online experiment by author Dean Wesley Smith, I began posting my weekly writing word count here on the site. I saw major growth in the word count until August, when it seemed to come crashing down. I'd broken the habit, the streak, or whatever you want to call it. I'd written the least I'd written since I started. Once you fall off the wagon like that, it's very de-motivating and hard to get back on again. 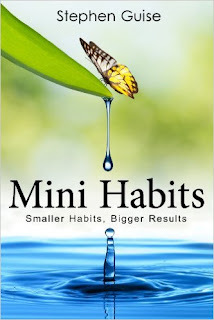 Perhaps by happy coincidence, Stephen Guise's Mini Habits: Smaller Habits, Bigger Results went on sale in late August on Amazon. I bought a copy, hoping it might have some useful ideas within it. It's too soon at this point to say, but I like what I am reading. Guise tells us that there are really only two ways we make ourselves do something: motivation or habit. Motivation can drive us to do amazing amounts of work in a fevered burst, but it's fickle. We can't summon motivation on demand, and we can't keep it flowing every day. Eventually, we run out of it and the activity stops. A habit is something we do automatically. We don't think about it, fret over it, or in many cases even make a conscious decision to do it. We just do it. We might have had to make a conscious decision at one point in our lives to brush our teeth, but eventually it becomes routine habit. We barely think about it, if we stop to think about it at all. If we could turn the things we want ourselves to be doing into habits, we'd be in great shape. We'd do them when we're not feeling particularly motivated. We'd do them when we're tired or stressed. We'd never even think about it. In time, it would seem strange or wrong to not be doing them. The problem is that habits are hard to form. Each early attempt to perform the habit requires a little bit of willpower to overcome our resistance to not do whatever it is we consciously want or need to do. When we've had particularly stressful or busy days, our reserve of willpower may be depleted and we can't summon the energy to do the thing. Once we fail at the new habit enough times, we tend to abandon it. The key to forming habits is to make them, as Guise calls it, so "stupid easy" that it's more work not to do the activity than to do it. Instead of setting a goal to work out for 20 minutes a week, you set the goal to do one push-up a day. That's it. Instead of setting a goal to write a novel in a year, you set a goal to write 50 words of fiction each day. 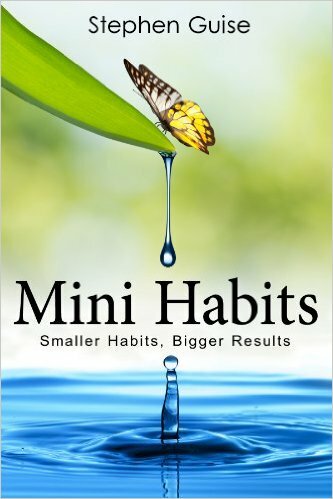 These "mini habits" are easy to do. The idea is to imagine your worst possible day. You're unmotivated. You're tired and stressed. You've got a lot on your plate. What's the smallest amount of work you can imagine doing at this time, and still be doing something toward your goal. That's your mini-habit goal. You want something so small that your subconscious won't be able to say you don't have the time or energy. This tiny little goal may seem ridiculous. There will be days where you reach it and stop. Other days you may have the time, energy, and willpower to blow past that goal. Even if you never do, you'll still be creating a habit that takes you closer to your goal eventually. For instance, 50 words a day will get you 18,250 words in a year. That's about 25-30% of a typical novel. If you have even one day a month where you write 1,000 words, you'll hit about 30,000 words in a year. A few more days like that and you'll have that novel written... all by just committing to a mere 50 words a day.